Bio Trainer Tracks Calories Burned All Day Long | OhGizmo! By Andrew Liszewski on 11/14/06 • Leave a comment! There’s no real secret to weight loss. Your body needs to burn about 2000 calories during a normal day and when sufficient fuel is not available to meet that goal it will start burning fat to maintain that level. And a lot of people think you need to spend your whole life at the gym for weight loss to be effective. While adding more muscle will help you burn off those extra pounds just increasing the amount of activity during your day can be just as effective. 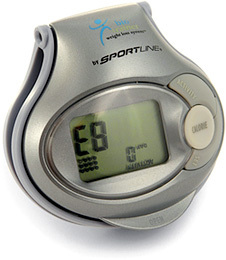 If you don’t believe me just clip on one of these Bio Trainers which unlike a pedometer will actually measure how many calories you’ve burned based on every movement your body makes. It uses a built-in motion sensor and a tri-axis accelerometer which is sensitive enough to even measure less vigorous movements like folding laundry or other household chores. The Bio Trainer will store and track calories burned over a 10-day period so you can go back and see what activities during the week were more effective than others. The Bio Trainer is currently available from Smarthome for $49.99.